Mina/Makkah (Saudi Arabia): Chanting “Labbaik Allahumma Labbaik” (Here I am, O God, here I am answering your call), about two million pilgrims, in white seamless dress, started converging in the tent city of Mina on Tuesday September 23, 2015. They started streaming into Mina by foot, on buses and other vehicles from early morning from Makkah and Madinah, as well as from other parts of the Kingdom. Mina witnessed moderate rain on Monday evening bringing down the hot temperatures as pilgrims started gathering at the vast tent city that has 160,000 fire-proof tents to accommodate them. The pilgrims arrived in Mina following the Sunnah of the Prophet Muhammad (peace be upon him) to spend the Tarwiyah Day (Watering Day) here before moving on to the plains of Arafat. They will spend today in their tents in preparation for tomorrow’s standing on Arafat, which marks the climax of Haj. In Mina, located 7 km north east of the Haram Mosque, they pray Dhuhr, Asr, Magrib, Isha and Fajr prayers. They shorten Dhuhr, Asr and Isha prayers to two Rakaats, following the tradition of the Prophet (PBUH). When the sun rises tomorrow, pilgrims will move to Arafat where they pray Dhuhr and Asr shortened and combined at the time of Dhuhr. 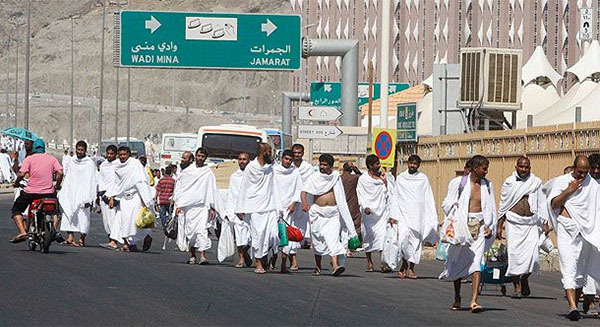 Large numbers of pilgrims were seen walking down to Mina from Makkah as King Abdul Aziz Road which connects it to the Haram Mosque was jam-packed with vehicles. The pilgrims’ movement is being taken place smoothly, thanks to the vast arrangements made by the authorities. Saudi authorities have mobilized all their human and material resources to make the pilgrimage hassle-free and a great success. After performing Isha (night) prayers at the Grand Mosque on Monday, pilgrims started streaming into the Mina valley. Most pilgrims embarked their life-time journey on board buses arranged by their respective tawafa organizations while some others preferred moving on foot. By midnight the Tent City, decked out to receive the Guests of Allah, was teeming with pilgrims, who were seen exchanging pleasantries after settling down in their respective locations. The Tent City is reverberating with the talbiyah of pilgrims who make final preparations for their standing (wuqoof) on the plains of Arafat on Wednesday, marking the climax of Haj. Almost all the Haj missions have readied a meticulously designed and flawless operation plan for the movement of pilgrims to Arafat after spending Tuesday in the Tent City. Under the leadership of Custodian of the Two Holy Mosques King Salman, Crown Prince Muhammad bin Naif, Deputy Crown Prince Muhammad bin Salman and Makkah Governor Prince Khaled Al-Faisal have arranged foolproof safety and security measures for the pilgrims. Nearly 100,000 men in uniform are at the holy sites to make the journey of a lifetime for the pilgrims safe and secure. About 60 percent of pilgrims were transported to Mina on Monday evening, according to the Haj Ministry’s grouping plan. The remaining 40 percent will be taken to the Tent City Tuesday. Maj. Gen. Muhammad Al-Qarni, adviser to the Haj minister for operations and emergencies, who is also head of the pilgrims’ grouping unit, said the grouping of the Guests of God has been going on since their arrival in the Kingdom. He said this was the fourth of the 12-phase grouping process. Three grouping processes have already been completed. “During the first grouping, pilgrims were sent to Makkah and Madinah after their arrival in the Kingdom. In the second, a total of 94,653 pilgrims were transported from Makkah to Madinah to pray at the Prophet’s Mosque. In the third grouping, pilgrims were transported from Madinah to Makkah,” he said. Qarni said all pilgrims have now assembled in Makkah ready to travel to Mina where they will stay the night and proceed on Wednesday to Arafat for Standing representing the Haj climax. He explained that the grouping of pilgrims is done electronically through the ministry’s e-portal.